Now that the Powder Keg has installed a tradition of technical skimo races in North America, it’s time to drop the excuses and grab the fixed rope. 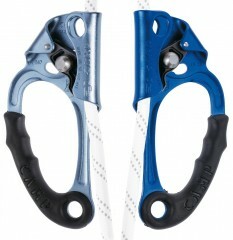 Best to grab it with the Pilot Ascenders from CAMP, since you don’t want to burn through your glove if you fall. Not to mention an ascender is required for your safety and the safety of those below you. Leave the weight and worry behind. 210 grams (7.4 ounces) each. Steel cam features 17 teeth for a secure grip on the rope. Low profile thumb release requires two actions to open the lock while quickly closing in just one. Aluminum frame keeps the handle light without sacrificing durability. Ergonomic handle with rubber sheathing gives you a secure and insulated grip. Wide radius hole accepts most carabiners or quick links for attaching slings to your harness. Fully CE and UIAA certified for ropes between 8 and 13 millimeters in diameter. Colored grey for left and blue for right, just like your hands. NOTE: If choosing one ascender for a race, go with your dominant hand. Most courses are set up for the ascender on the right. Does this come with both the left and right hand ascenders for $59.95 or do I have to order each side separately? Hi Brycen, the price is for one hand. You'd need to add both to your cart if you want both sides.